We created this PLANTERS® Mr. PEANUT™ 100th Anniversary Cake recipe to celebrate the dapper dude's 100th birthday. As celebration cakes go, it's a winner! Brush 9 of the pretzels evenly with some of the melted semi-sweet chocolate; place in single layer on wax paper-covered baking sheet. Let stand until chocolate is firm. Cut or break remaining pretzel into 1-inch pieces. Dip in semi-sweet chocolate, turning to evenly coat each piece. Arrange in curved shape at top of one of the chocolate-coated pretzel rods to resemble handle of cane (see photo), securing pieces to each other with additional melted semi-sweet chocolate. Let stand until chocolate is firm. Meanwhile, place 2 of the grahams, with long sides together, on wax paper-covered baking sheet to resemble top of hat. Brush with some of the remaining melted semi-sweet chocolate until grahams are completely covered with the chocolate, using additional melted chocolate to secure grahams to each other. Cut or break remaining graham in half lengthwise; place, with short ends together, at bottom edge of hat to resemble brim of hat. Brush rim with some of the remaining semi-sweet chocolate to completely cover grahams and to secure pieces together. Let stand until chocolate is firm. Brush one long side and bottom half of each of 2 of the peanut butter sandwich cookies with the remaining semi-sweet chocolate to resemble shoes (see photo). Spread uncoated part of each cookie with the white chocolate to resemble spats. Draw hands on the 2 remaining peanut butter cookies with some of the remaining white chocolate. Write "MR. PEANUT" on hat, then decorate rest of hat with any remaining melted white chocolate as desired. Arrange brim and top of hat on cake trimmings positioned at top of "peanut." Insert 2 of the coated pretzels into side of MR. PEANUT's body for the arms and remaining 2 coated pretzels into side of bottom cake for the legs. Add "cane" to bottom end of one of the arms. Position one hand at end of each of 2 of the pretzel rods and one shoe at end of each of the remaining 2 pretzel rods. Add chocolate cookie half, filling-side up, to top cake as shown in photo to resemble Mr. PEANUT's monocle. Add jelly bean for the remaining eye. (Reserve remaining cookie half without filling for snacking or another use.) 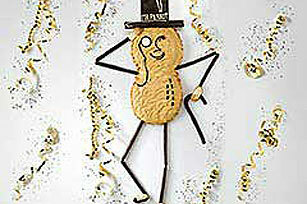 Arrange licorice pieces on cake for Mr. PEANUT's nose, mouth, peanut ridges and string on monocle as shown in photo. Press peanuts into frosting around side of cake. Store in refrigerator. Delight your loved ones with this adorable cake! Since it serves 20, this crowd-pleasing treat is a great addition to any large family gathering. Since this special-occasion cake is time-consuming to make, be sure to bake and assemble the cake the day before. Then, frost and decorate just before serving.